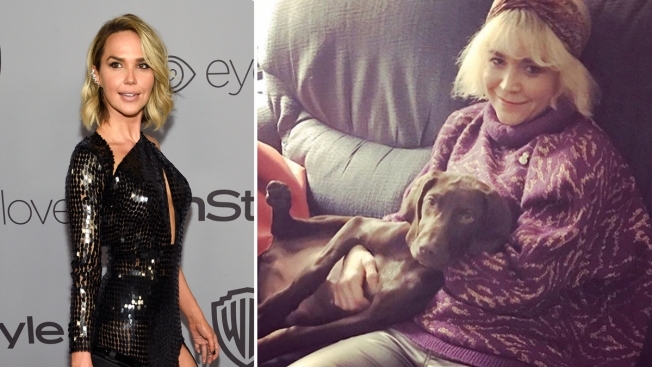 Arielle Kebbel (left) is looking for her missing sister (right), Julia Kebbel, who was last seen walking her chocolate Labrador in Los Angeles' Silverlake area on Jan. 31. Arielle Kebbel is looking for her missing sister, Julia Kebbel, who was last seen walking her chocolate Labrador in Los Angeles' Silverlake area on Jan. 31. The actress, who appears in the upcoming "Fifty Shades Freed", took to Instagram on Saturday to ask fans for help in finding her loved one. The 32-year-old star wrote, "ALERT. My SiSTER JULIA KEBBEL is MISSING. She was last seen in silver lake, walking her chocolate lab, Cindy, at 11 pm wed night. 1/31/18." The "Unreal" actress also posted a description of her petite sister, "She is 5'3 . Weighs about 105 pounds. Fair skin. Bleach blonde short hair. She has tattoos on both forearms. She has a spiritual symbol w/ a key and the words promise on one forearm and a blue Phoenix rising on the other." The concerned sister also shared Julia's Instagram and Twitter accounts to help her fans identify her sister. Arielle continued, "Her chocolate lab is named Cindy Crawford. She is chipped. If anyone finds the dog or has seen her, pls let us know. Julia's Instagram and Twitter is @jkebbz pls go there to see more pictures of her." According to People, the last day that Julia was seen, there was a fire in her apartment. Arielle concluded the post, "If you have seen her or know anything about her, pls DM me, contact the police or pls call Dennis at 407-739-8991. Pls share this info with anyone and everyone." The Los Angeles Police Department told NBC4 that there is an open investigation into Julia's disappearance, but there's nothing indicating it's suspicious at this time. Her father Dennis said the family is extremely concerned about her whereabouts and that this is uncharacteristic of her. Anyone with information is asked to contact the LAPD at 877-ASK-LAPD. NBC4 Los Angeles contributed to this report.